YouTube is a useful engagement tool for businesses — here’s what you need to know. This is part one of a three-part series on YouTube for business. Check out part two, Cheap and Easy Tools for Creating YouTube Videos, and part three, Seven Ways to Get More Views on Your YouTube Videos. Video is not just for funny cats and cover artists anymore — it’s the most popular form of content being consumed online. As such, YouTube has become the second largest search engine in the world, with more than one billion users conducting over 3 billion searches per month. Take a moment to let that sink in. After Google, people are searching YouTube for content. 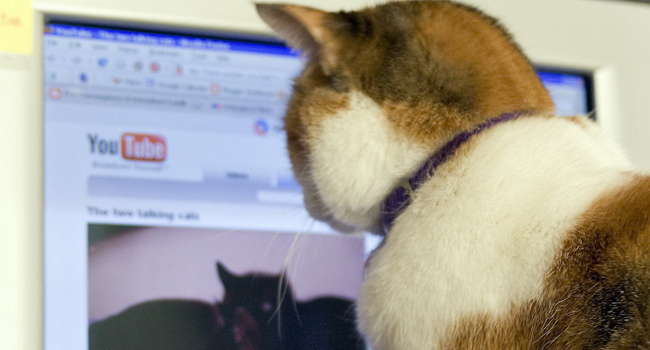 Strike that: Over one billion people are searching YouTube for content. This has raised the eyebrows of content marketers across many industries, including B2B businesses, who recognize the enormous potential for reaching customers through this medium. If you haven’t considered distributing content through YouTube, you may soon find yourself scrambling to catch up with your competitors who are. For those who don’t know much about YouTube or are clueless about how it can work for business, here are a few basics to get you started. YouTube is a free video-sharing website and social media platform that allows users to view, upload, share, rate, and comment on content. It was launched in 2005 by three former Paypal employees and purchased by Google in 2006. It now operates as a subsidiary of Google. You do not have to be a registered user to view content, but you must be registered to upload content. Registered users can also subscribe to content providers’ channels to receive updates when something new is available, and can create playlists of favorite videos to view at any time. In addition to being available on the YouTube website, YouTube videos can be embedded, shared, or uploaded to other sites (such as Facebook). YouTube has massive potential for businesses. Here are just five reasons to participate. With over one billion users viewing nearly 5 billion videos per day, YouTube reaches more 18-49 year olds than any cable network in the U.S.
Users watch around 3.25 billion hours of video every month. 80% of views are from outside the U.S.
More than half of views are from mobile devices. YouTube videos are included in Google’s search results, ranking above web pages in certain searches. Potential customers searching for products and services like yours will be more likely to find you in such instances. Video has become so popular for a reason: People like consuming it. By producing content in this medium, you are offering a user experience that is in high demand. Video is the ideal storytelling platform, and it’s also perfect for how-tos, product demonstrations, and other content that demonstrates your company’s expertise. Show your brand personality and engage your audience while building your reputation as a thought leader in your industry. YouTube Analytics makes it easy to see who is watching your videos and how they are engaging with them. Run reports on audience demographics, revenue, engagement, traffic sources, and more. There are two avenues for businesses who are looking to reach YouTube’s more-than-3-billion users. For one, businesses can buy ads that run before other videos, beside playing videos, and in search results. Video ads are not covered in this post, but you can learn more about them here. Secondly, businesses can create their own YouTube channel and upload original content as part of their inbound marketing programs. To get started, you will need to sign into your business’ Google account or create one. Find the sign in button at the top-right corner of the YouTube homepage. With your account, you will own your very own “channel,” on which you will post your content. Branding your channel is an important step, as this will be the face of your company on this platform. Below are some tips. Coyote Logistics, a 3PL provider, has done an excellent job of branding its YouTube channel. Upload your company’s logo by hovering over the channel icon and clicking the pencil icon when it appears. Upload an image that represents your brand and what users will find on your channel. Hover over the channel art, click the “Add channel art” button or the pencil icon in the upper-right corner and select “Edit channel art.” Coyote Logistics makes a bold statement (very representative of its brand personality) here. For the best results on all devices, YouTube recommends uploading a single 2560 x 1440 px image. Click the customize button to create a layout for your channel. You can add up to 10 “sections,” which allow you to group videos in a particular way. For example, you could add sections of recent uploads, popular uploads, playlists, etc.This helps visitors to decide what to watch — and lets you promote content you wish for visitors to see. 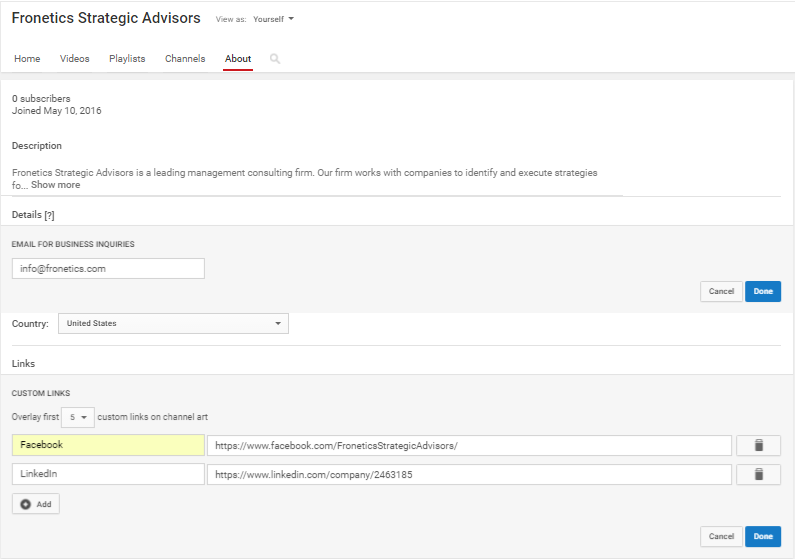 Navigate to the About section to add a channel description, business email address, country, and social links (if you haven’t already). Once you have your channel set, you’re ready to start adding your original content. YouTube Help has a wealth of resources to help you get started, problem-solve, and learn more. The below video offers an introduction to uploading videos in just a few quick steps. Playlist: Playlists let you organize your videos into different categories, like interviews, tips, product demonstrations, etc. Learn more. Channel trailer: A short video, like a movie trailer, that gives visitors an idea of the kinds of videos they’ll find on your channel. Learn more. YouTube Red: This is the premium subscription option that allows you to view videos without ads, watch videos offline, and more. How does your company use YouTube?